I am a couple of weeks in to my trial of the new Medtronic Guardian Connect and I'm busily making notes to bore you all senseless with my thoughts about it at some point over the next couple of weeks, but thought I could grab the moment yesterday to shoot a short video showing sensor insertion for Enlites with the new 'One-press' serter. Guardian Connect is a new 'standalone' CGM from Medtronic which is primarily intended for people on multiple daily injections, or who use other brands of insulin pump (as a standalone system it does not communicate with any of their insulin pumps or integrate with their 'low glucose suspend' Smartguard technology). I'll talk a bit more about this later when I post my review - there are other options available elsewhere in the world, but for us in Europe, the Connect system does not communicate with Medtronic insulin pumps, at least not yet. 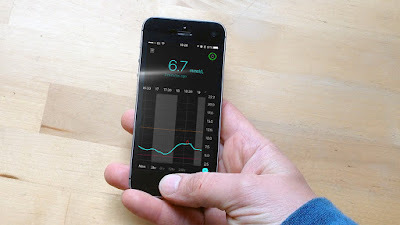 Following in the footsteps of Dexcom's G5 and Dexcom Share, one cool feature of Medtronic's Guardian Connect is that rather than using a separate handset, the CGM information is displayed on your iPhone. Guardian Connect also uploads your data automatically to the Carelink cloud in real-time, which offers the ability to share your CGM data with a partner/spouse/parent/friend/random stranger. You can also set Carelink to issue SMS text alerts to particular people if the sensor detects low glucose levels and you do not respond to the alert within a given time. This sharing of CGM data can provide a valuable safety net for people who live alone, or for parents of a child with diabetes. At the time of writing I am not aware of an Android version, so Medtronic's Guardian Connect currently requires you to have an iOS device. Just to warn you about the video - I wear the sensors in my abdomen, so you will have to prepare yourself for copious footage of my belly. Not so much NFSW as NSFA (not suitable for anywhere). Like that? There are more on my Youtube Channel. Disclaimer: Medtronic offered me a trial of the Guardian Connect on loan with enough sensors to last 30 days. I have not been asked to write this or any other post about it, and reserve the right to say that I like it if I do, and to gripe about anything that frustrates me. Tinkety tonk old fruit etc.